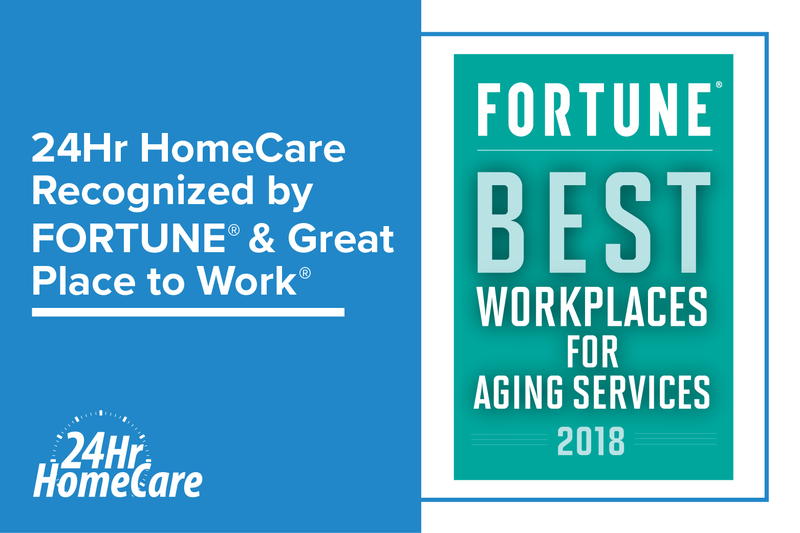 Los Angeles, CA – Great Place to Work and FORTUNE have honored 24 Hour Home Care as one of the 2018 Best Workplaces for Aging Services in At-Home Care. The ranking considered more than 76,000 employee surveys from companies in the Aging Services industry. Great Place to Work, a global people analytics and consulting firm, evaluated more than 50 elements of team members’ experience on the job. These included the extent to which employees trust leaders, the respect with which people are treated, the fairness of workplace decisions, and how much camaraderie there is among the team. Rankings are based on employees’ feedback and reward companies who best include all employees, no matter who they are or what they do for the organization. 24 Hour Home Care took the number 4 spot on the list. The Best Workplaces for Aging Services stand out for excelling in the industry’s rapidly-changing marketplace. In 2018, 24 Hour Home Care put an emphasis on the employee experience by forming a Culture Committee, led by a dedicated resource within the company. Within the past year, 24 Hour Home Care has been able to boost morale, camaraderie and solidarity within the company by engaging their employees to participate in team building activities. The Best Workplaces for Aging Services is one of a series of rankings by Great Place to Work and FORTUNE based on employee feedback from Great Place to Work-Certified™ organizations. FORTUNE is a registered trademark of Time Inc. and is used under license. From FORTUNE, September 27, 2018 © 2018 Time Inc. Used under license. FORTUNE and Time Inc. are not affiliated with, and do not endorse products or services of, 24 Hour Home Care.